Some may wonder why the U.S. military looked all the way to Australia to find a Teleport to provide them with their highly sensitive, mission critical satellite communications. However, this came as no surprise to Australian Teleport providers, who know they are in a unique position to be able to deliver secure, reliable, undisrupted satellite communications, thanks to their rare and stable landscape. As a politically and geologically stable country, with low rainfall and mild temperatures, Australia provides the perfect location to house Teleports and satellite infrastructure. Australia is a geographically remote country, ensuring minimal frequency interference. Plus, the country shares a border, albeit at some distance, with the USA via the Pacific Ocean, providing direct cable access (via the Southern Cross Cable Network) to the USA. Lt. Gen. Sheridan is the Commander of Space and Missile Systems Center, Air Force Space Command, Los Angeles Air Force Base, California. He also manages the research, design, development, acquisition, and sustainment of space and missile systems, launch, command and control, and operational satellite systems. General Sheridan is the Air Force Program Executive Officer for Space and oversees the Air Force Satellite Control Network; space launch and range programs; the Space-Based Infrared System Program; military satellite communication programs; the Global Positioning System; intercontinental ballistic missile programs; Defense Meteorological Satellite Program; the space superiority system programs; and other emerging transformational space programs. Space and Missile Systems Center was the presitigious 2009 SpotBeam Award recipient of the National Security Space Award for their Defense Meterological Satellite Program. General Sheridan graduated from the University of Connecticut in 1973 with a Bachelor of Science in mechanical engineering. He completed the universitys Air Force ROTC program as a distinguished graduate. Following an educational delay to earn a Master of Business Administration degree from Bryant College in Rhode Island, he entered active duty in August 1975. His wealth of experience includes acquisition leadership of aircraft, simulator and classified space programs; requirements development across all Air Force space programs; and operational leadership in four different national space programs. He has served as military assistant to the Assistant Secretary of the Air Force for Space, Commandant of Air Command and Staff College, Director of Requirements at Headquarters Air Force Space Command, and as the Deputy Director of the National Reconnaissance Office. Command Center: Andy Beegan, CTO + Sr. V.P., Segovia, Inc. In his current role, Mr. Beegan is responsible for Segovia Core Engineering, Network Operations, and Solutions Delivery. He has commercial and government experience in engineering management, strategy, business development, satellite RF and IP network design, and program management. Mr. Beegan joined Segovia in its infancy and has played an integral role in the companys network design, product development, and government contracting activities. Mr. Beegan returned to the Segovia team from Booz Allen Hamilton where he supported satellite-related projects for multiple U.S. government agencies. Prior to Segovia, Mr. Beegan served as a Senior Satellite Applications Engineer for PanAmSat (now Intelsat). Mr. Beegan has a Bachelor of Science degree in electrical engineering from the University of Notre Dame and a Master of Science degree, also in electrical engineering, from Virginia Tech. In addition, Mr. Beegan has an MBA from the University of Maryland Smith School of Business. Just as in any line of work, effective communication is a must within the military. However, unlike most work scenarios, soldiers ability to communicate effectively can be a matter of life and death. They must be able to relay timely messages through a secure network in order to ensure safety and success. For MTN Government Services (MTNGS), this is a task that inspires mega-wattage star appeal: The company has launched a communications system for a cause that connects soldiers to a top-tier lineup of pro jock athletes who include future NBA Hall-of-Famer Shaquille ONeal; Indy 500 winner and IRL champion Dan Weldon, and boxing legend Evander Holyfield. As a result, MTNGS is supplying its tech know-how at the nations top arenas and stadiums, for marquee events such as the Indy 500, the Super Bowl, and the MLB/NBA all-star games. 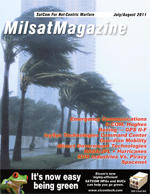 Focus: Rapid Deployment Of Cellular Over Satcom, author: Richard Hart, Senior Product Line Manager  Mobile Platforms, Powerwave Technoloiges, Inc.
Planning to restore communications in the event of a natural or man made disaster can be a daunting task to say the least. One must consider a multitude of scenarios and plan for the worst. One such option to consider would be a rapid mobile deployment unit (RMDU). Generally speaking an RMDU has the following features: rapidly deployable, telescoping mast, off-grid power solution, equipment enclosure, communications capacity and coverage solution, backhaul solution and command and control elements. In selecting a partner for such a solution one should consider a vendor with a breadth of knowledge and experience in all the technical disciplines that make up an RMDU. Planning to restore communications in the event of a natural or man made disaster can be a daunting task, to say the least. One must consider a multitude of scenarios and plan for the worst. One such option to consider would be a rapid mobile deployment unit (RMDU). Generally speaking, an RMDU has the following features: rapidly deployable, telescoping mast, off-grid power solution, equipment enclosure, communications capacity and coverage solution, backhaul solution and command and control elements. In selecting a partner for such a solution one should consider a vendor with a breadth of knowledge and experience in all the technical disciplines that make up an RMDU. Communications-on-the-move (COTM) is vital to U.S. military and intelligence missions at home, abroad, and in theater. Even in a time of leaner budgets, the current threat landscape requires the military to continue advancement of net-centric communications, together with intelligence, surveillance, and reconnaissance (ISR) capabilities. Increased use of satellites is essential to maintain over-the-horizon communications for command and control (C2) and ISR missions, requiring ever more efficient use of high-capacity bandwidth in theater. Faced with these challenges and the reality of tight budget constraints, the military needs to reexamine how to provide the highest quality COTM solutions to troops, while limiting operational costs. As the ability to monitor satellite transmissions grows more sophisticated, the need to implement increased levels of security becomes more critical. In combatant situations, where even a small spike in traffic can be a critical piece of intelligence, the need to mask any communications activity becomes apparent. The National Security Agency (NSA) in the United States has outlined the following vulnerabilities inherent in an IP-based TDMA transmission that must be addressed in order to provide true Transmission Security, or TRANSEC:  Channel Activity  The ability to secure transmission energy to conceal traffic volumes.  Control Channel Information  Disguise traffic volumes to secure traffic source and destination.  Hub and Remote Unit Validation  Ensure remote terminals connected to the network are authorized users.  Anti-Jam and Low Probability of Intercept  While a consideration, this is not a mandate by the NSA or any other organization.